Above: Massive wildfires torched tinder-dry California in August 2018, after the state experienced its hottest month on record in July. The record heat was caused by an unusually extreme jet stream pattern that brought a persistent and highly intense ridge of high pressure over the Western U.S. The Mendocino Complex Fire became the largest fire in modern history in California, based on official Cal Fire data beginning in 1932. The Carr Fire was the sixth-most destructive fire on record in the state, having destroyed 1,604 structures (1,079 homes). Total fire damage in California was more than $1 billion. 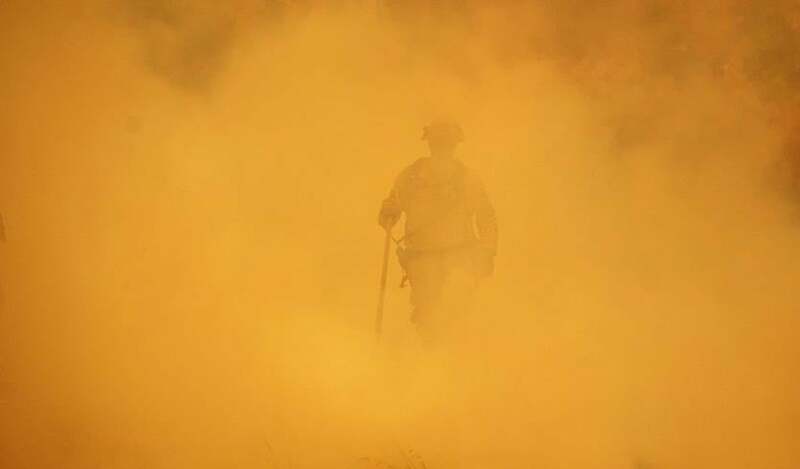 Above: A firefighter emerges from smoke from the largest fire in California history, the Menocino complex, on July 30, 2018. Image credit: Josh Edelson/AFP/Getty Images. During the summer of 2018, the future of climate change became the present. Highly amplified jet stream patterns that remained stuck in place for unusually long periods of time brought the planet a series of remarkable weather catastrophes—unprecedented heat waves in East Asia and Northern Europe, choking smoke from a record fire season in California and Washington, and Japan’s deadliest floods since 1982, to name a few. 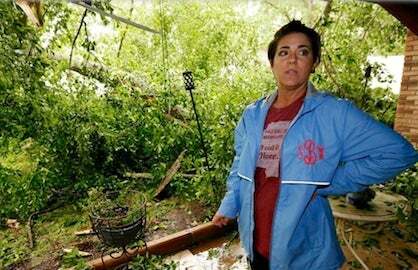 The severe summer weather helped bring the 2018 tally of billion-dollar weather-related disasters to 35--a startlingly high number that is already the third highest such total for any year since 1990, according to statistics supplied by Steve Bowen of insurance broker Aon Benfield. Research published on Wednesday (open access), led by climate scientist Dr. Michael Mann of Penn State, predicted that our future climate is likely to bring a significant increase in “stuck” summertime jet stream patterns capable of bringing a rise in extreme destructive weather events like we experienced in 2018. Their paper was titled, Projected changes in persistent extreme summer weather events: The role of quasi-resonant amplification. Figure 1. 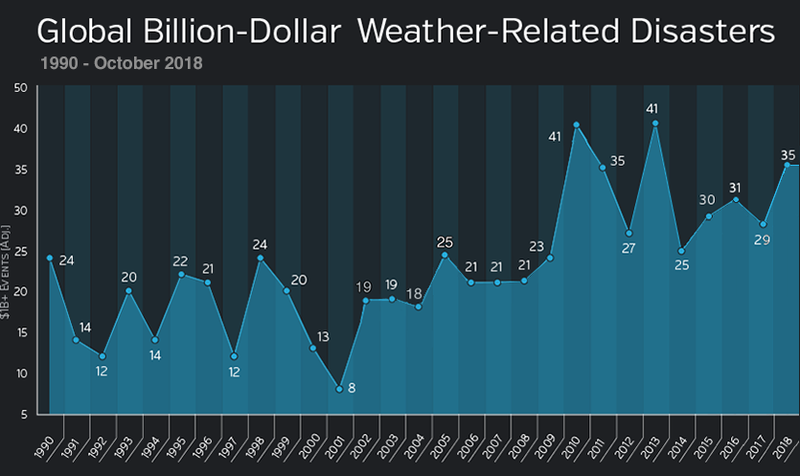 The yearly number of billion-dollar global weather disasters, adjusted for inflation, as compiled by insurance broker Aon Benfield in their Annual Global Climate and Catastrophe Reports. The figures for 2018 are only through October, yet we have already seen the third highest number of billion-dollar global weather disasters on record for a year--thanks, in part, to an unusually persistent and extreme summertime jet stream pattern that brought extended periods of extreme weather to portions of the globe. The increasing trend in weather disaster losses in recent decades is largely due to increases in wealth and population and to people moving to more vulnerable areas, but climate change is likely to play an increasing role in coming decades in disaster losses. 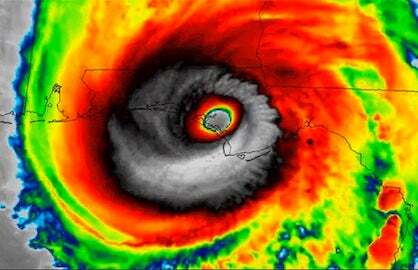 We discussed this topic in more detail in a 2012 post, Damage Losses and Climate Change. Earth's atmosphere has two fundamental patterns. One is a series of wave-like troughs and ridges in the jet stream called planetary (or Rossby) waves, which march from west-to-east around the globe at about 15 - 25 mph. 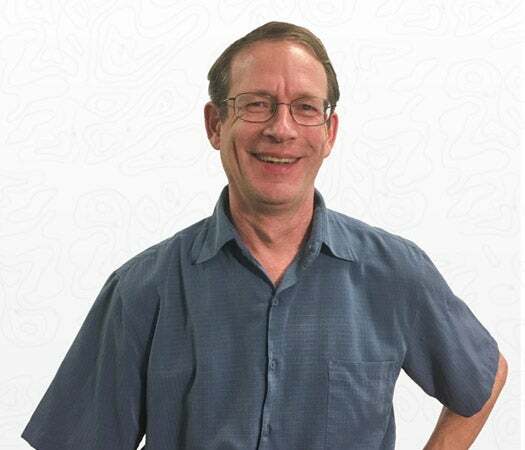 The other pattern behaves more like a standing wave, with no forward motion, and is created by the unequal heating of the equatorial regions compared to the poles, modulated by the position of the continents and oceans. A number of papers have been published showing that these two patterns can interact and resonate in a way that amplifies the standing wave pattern, causing the planetary waves to freeze in their tracks for weeks, resulting in an extended period of extreme heat or flooding, depending upon where the high-amplitude part of the wave lies. Because human-caused global warming is causing the Arctic to heat up at least twice as rapidly as the rest of the planet, the two patterns are interacting more frequently during the summer. A 2013 paper by Coumou et al., which I reviewed in my blog post, Are atmospheric flow patterns favorable for summer extreme weather increasing? 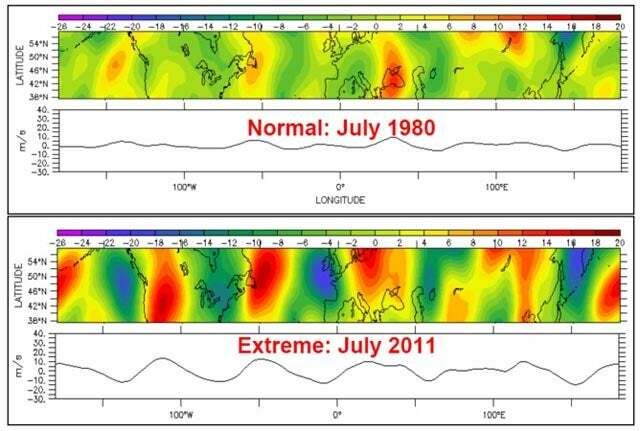 found that during the 11-year period 2002 - 2012, there was a doubling in this unusually extreme resonance pattern in summer, compared to the two previous eleven year periods, 1991 - 2001 and 1980 - 1990. The phenomenon is known as Quasi-Resonant Amplification or “QRA”, and is described in excellent detail in an October 2018 realclimate.org post by Michael Mann. Figure 2. The northward wind speed at an altitude of 300 mb in the mid-latitudes of the Northern Hemisphere during July 2011 and July 1980. July of 2011 featured an unusually intense and long-lasting heat wave in the U.S. that cost $14 billion, and the normally weak and irregular waves (like observed during the relatively normal July of 1980) were replaced by a strong and regular wave pattern, characteristic of a quasi-resonant amplification (QRA) event. Negative values, blue on the map, indicate southward flow. Image credit: Vladimir Petoukhov. Several newer studies have found further evidence of an increase in QRA events, including Mann et al. (2017), Influence of Anthropogenic Climate Change on Planetary Wave Resonance and Extreme Weather Events, and Lehmann et al. (2015), Increased record-breaking precipitation events under global warming. The Mann et al. study released this week found that summertime QRA events in the average of over 20 climate models studied increased from the current historical level of ~7.5 events/year to ~11 events/year by the end of the century, i.e., a roughly 50% increase in the annual number of events. However, some models predicted a tripling of such stuck jet stream patterns. The key reason for the variation in the various model results was in how they handled the small air pollution particles called aerosols. These particles cool the globe by reflecting sunlight, primarily over the mid-latitude where most pollution sources lie. If humans clean up the air by installing pollution-control devices that scrub out these particles, the mid-latitudes will tend to warm up faster than they have been, altering the contrast in temperature between the poles and the equator to cause a slower increase in QRA events. Keep in mind that these small air pollution particles are also being blamed for approximately 3 million premature outdoor air pollution deaths globally each year. In the U.S., this death toll in 2013 alone was 91,000, with a cost of at over $500 billion (2.8% of GDP), according to the World Bank (2016). 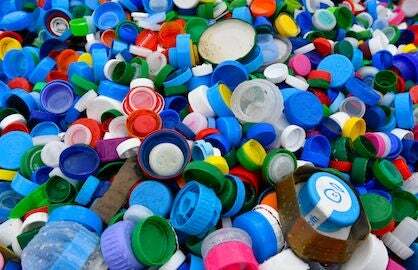 Thus, we now have two urgent reasons to clean our skies of particle pollution! Figure 3. In late June through mid-July 2018, an unusually persistent and extreme jet stream pattern brought a three-week period of intense rainfall to southern Japan. Large swathes of the region received 10-day rainfall accumulations over 400 mm (15.75 in). The resulting floods caused over $7 billion in damage and killed at least 225 people, making it Japan’s deadliest flood disaster since 1982. 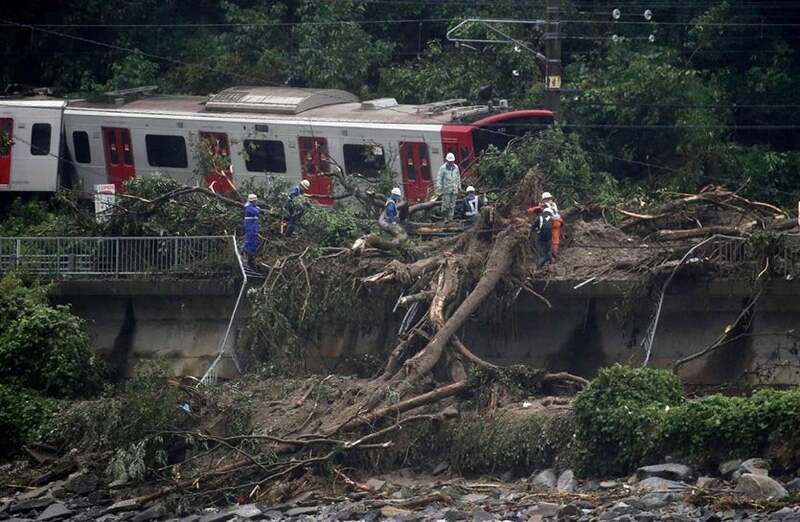 Above: An emergency crew works at the site after a train derailed due to landslides caused by heavy rain in Karatsu city, Saga prefecture on July 7, 2018. Image credit: STR/AFP/Getty Images. “So, is there any hope to avoid future summers like the summer of 2018? Probably not. But in the scenario where we rapidly move away from fossil fuels and stabilize greenhouse gas concentrations below 450 parts per million, giving us a roughly 50% chance of averting 2°C (3.6°F) planetary warming (the so-called “RCP 2.6” IPCC scenario) we find that the frequency of QRA events remains roughly constant at current levels.